Yorkshire puddings can be found in most households at the very least on Sundays, but if it’s my house we’ll have a Sunday dinner any day that ends in y. As an American, there is nothing better than having the equivalent of Thanksgiving Dinner every Sunday or even on a cold night during the week. Yorkshire pudding history is fraught with mystery. There isn’t any information about when it came to Britain or how long it’s been here. The first mention of this light, airy pudding was in a book written in 1737 by William Kendrick called The Whole Duty of a Woman. It included a basic recipe of cooking it under a leg of mutton for meat drippings, and they called it a “dripping pudding”. It’s come a considerable way since then. Ten years later in 1747, Hannah Glasse renamed this dripping pudding to Yorkshire pudding in her book The Art of Cookery Made Plain Easy and the name stuck. Today we’re eating them every week, they can be found in most restaurants and are one of the nation’s favourite foods. 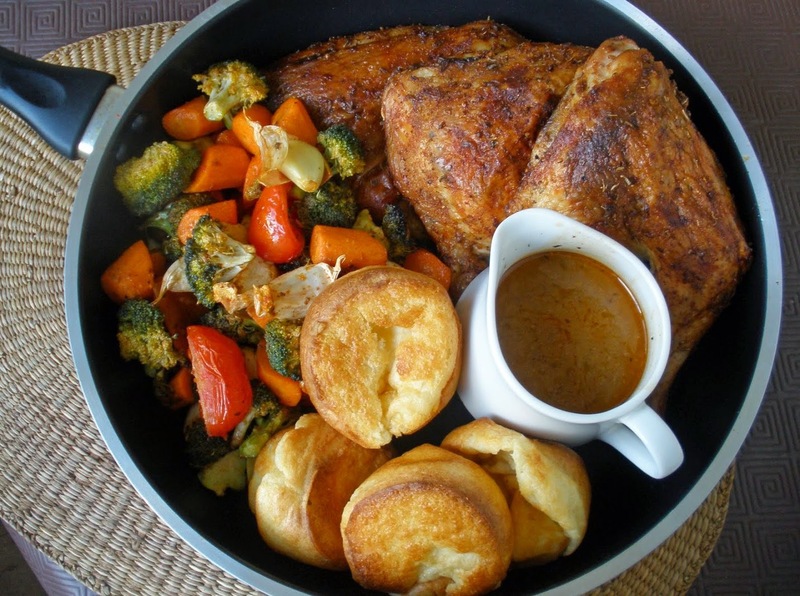 Yorkshire puddings are divine filled with rich gravy on the side of a Sunday dinner. But let’s think outside the box and use the Yorkshire for something other than Sunday dinner. One way to get an extra Yorkshire Pudding into your day would be this beaut from Amuse Your Bouche. The recipe requires pre-cooked store bought Giant Yorkshires, but if you’re like me and prefer to make your own I’ve included the link to a Giant Yorkshire Pudding recipe below. The smokey flavouring of the roasted vegetables mixed with the sweet roasted tomatoes and creamy egg makes this a delicious twist for the Yorkshire Pudding. 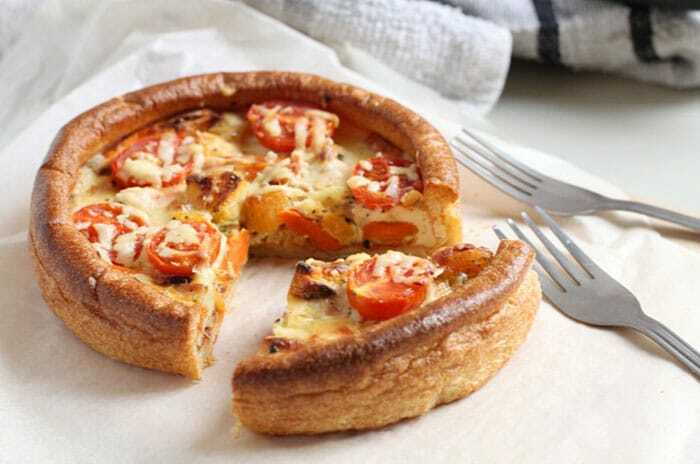 The recipe is versatile as well, use whatever quiche recipe you favour and use your Giant Yorkshire as the crust. My only tip would be to watch the time in the oven so that your Yorkshire Pudding doesn’t get too crispy around the edges. Perfectly named Homemade by You these Giant Yorkshires may not be as neat and tidy as those that are store bought but at least you know exactly what goes in them. Popovers are the American equivalent of the Yorkshire pudding. Nothing to stop us from making them here in the UK. 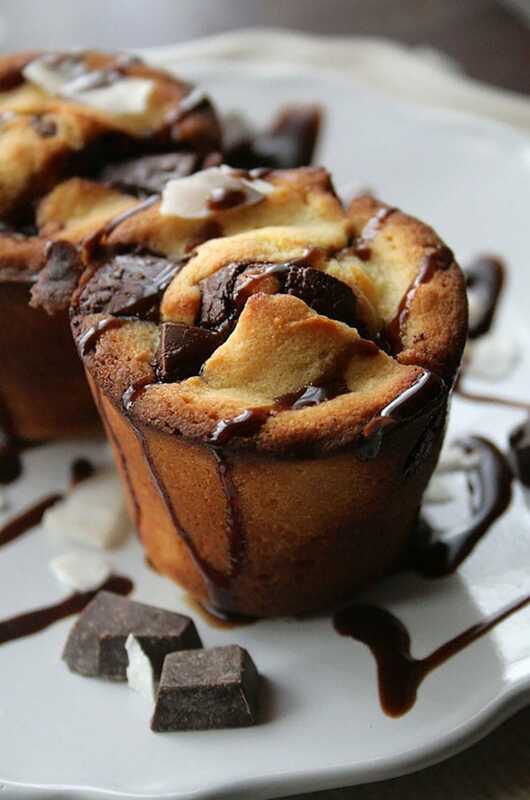 These Dark Chocolate and Coconut Yorkshire Puddings from Doughmesstic may be the perfect answer to a new pudding to serve at a family dinner or even to serve around the holidays. You’ll certainly not be bringing just another container of mince pies or Christmas pudding. Made with a mixture of coconut flour and white flour these have a delicate taste of coconut right down to the batter. The recipe does suggest altering the amount of milk you add to the mixture to account for the porous nature of the coconut flour. This will keep your puddings from being too stodgy. Beautiful canapés in the form of mini Yorkshire Puddings, sign me up. 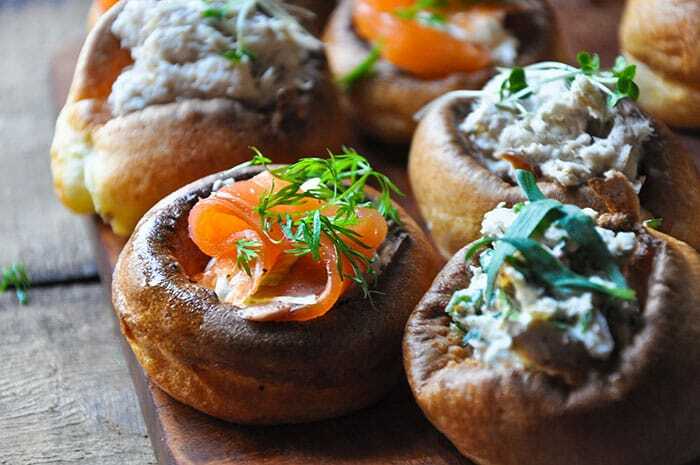 These individual mini Yorkshire puddings are stuffed with everything from smoked salmon to tarragon chicken. DomesticSluttery provides four recipes for your next cocktail party. Smoked Mackerel and prawn cocktail mini Yorkshire canapés round out the recipes offered on the blog. I would suggest doing a chicken tikka canapé if you have a favourite recipe, maybe a vegetarian option something like a garlic mushroom or even a pizza / margherita version of this fun twist on the normal canapé! Impress your friends and colleagues with this unique way to serve up the Yorkshire pudding. Yorkshire puddings definitely aren’t reserved for just roast dinners any longer. We’ve highlighted some of the sweetest ways you can prepare the delicious Yorkshire pudding, making it into a true “pudding”. This recipe seems like something we’d find in a Michelin starred restaurant (in much smaller portions of course). It’s the beautiful Yorkshire pudding prepared with caramelised pears, blueberries, honey and ginger and served with ice cream. Food To Love has definitely given us the perfect after Sunday dinner treat. If you don’t fancy one of these exceptional recipes why not just build a Yorkshire into your everyday meals? Full English in a Yorkshire, Curry in a Yorkshire, Bolognese in a Yorkshire; the possibilities are endless.